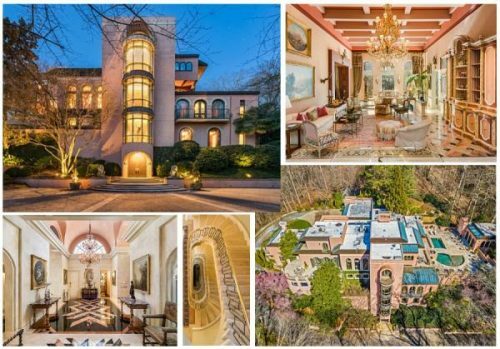 Debra Johnston, named Top 5 Best Individual Agent in Atlanta, offers a rare New York Style 7-bedroom luxury listing that features 7 acres of exquisite grounds. Atlanta’s leading luxury agent, Debra Johnston, lists the ultimate secluded sanctuary and one of the most exquisite examples of Art Deco mastery. In the exclusive Winterthur Estates, nestled at the end of a cul-de-sac and ensconced in the grounds of a lush 7-acre domain, this rare offering boasts seven bedrooms, 8 full baths, 5 half baths, as well as 17-20 foot ceilings, an abundance of flawless marble finishes, an elevator, wine cellar, theater, pool house plus heated pool and even caters to guests with a fully equipped second floor apartment. It’s time to reward yourself with 18,537 square feet of opulence in this new benchmark in luxury living and entertaining offered for $3.95 million. A winding driveway, flanked by meticulous landscaping lays in wait behind the gated entry, with the motor court delivering you to the front double doors of this Henri Jova masterpiece. An Italian Villa which rises up to meet you was first conceived by the talented Atlanta architect in the 1980’s and has since been restored to meet today’s modern standards. The same color as the famed Beverly Hills Hotel in Los Angeles, it presents with a hand applied, hard coat stucco façade over a concrete exterior. Meticulously maintained, this property personifies the finest in Art Deco flair and design right down to the furniture and light fixtures. Stepping inside, a magnificent marble foyer sets the tone for the lavish living and elegant New York style. The home is a ‘smart design’ allowing for both family and guests to enjoy the massive residence while having their own privacy wings. The left side of the estate is the family residence as you drive up to the motor court and walk straight in to the main foyer, living room, dining, kitchen, master, and guest suite. Whereas the right side of the residence is home to the guest suites and elevator/stairs to the theater on the 5th floor. You’ll relish hosting family and friends in the formal living room, set under a soaring ceiling, or the marble accented dining room, which is a feast for the senses. French doors frame this space and look out to the patio, where you’ll dine in the sunshine and revel in mother nature’s beauty. The designer galleria kitchen is also a splendid space, housing a breakfast bar and breakfast room, island, keeping room and a walk-in pantry. Integrating with the cozy family room, it features a fireplace and coffered ceilings and is a room which will embrace you with its warmth. Decadent gold doors peel back to reveal the sumptuous master suite, where you can curl up in front of the fireplace in your plush, personal sitting room, make the most of the deluxe dressing room and en suite, or seek out a spot for relaxation in one of the many alfresco areas which fringe this space. These include a screened patio, courtyard with water feature and thriving gardens, and a sun room set under a tempered glass ceiling. Awaiting atop a travertine staircase, a home theatre, sunken bar, and lounge of unrestrained elegance will also impress. Guests are also well catered for, with the second floor boasting a full kitchen, 2 bedrooms, living room, gym, and separate parking. Encased in a natural wonderland, the outdoors will tempt you often. Escape to the fire pit to look down over the grand estate, retreat to the art deco pool house and bar for a gathering in inimitable surrounds, or lounge by the heated, pebble tec pool. You’ll also enjoy the superior inclusions of a tea room/study with an exceptional marble fireplace, a guard house, 4-car garage, green house next to the motor court, spa, fitness center, and generator. There’s also security and intercom plus residents in the gated and secure Winterthur community have two new tennis courts to enjoy. Perfectly positioned in an exclusive enclave, this masterpiece presents in an immaculate fashion and also offers the option to purchase the furnishings. 5975 Winterthur Ridge is ideally situated just 10 minutes north of Buckhead bringing you the nearby convenience for the best Buckhead, Atlanta offers from the notorious high-end shopping, acclaimed restaurants, and some of the nation’s top ranked private schools. Truly a charming abode, with a thoughtful and spacious open floorplan, it is ideal for those seeking a privileged and private lifestyle.